What is an expense ratio? It is a fee that mutual fund companies subtract from your investments each year for their service. Can that small fee have such a big impact on long-term investment performance? The answer is a resounding YES — high expense ratio could eat up to 50% of your gain — given enough time, high expense ratio mutual funds can cripple your investment growth potential. Now let’s assume these funds have the same return before expenses. 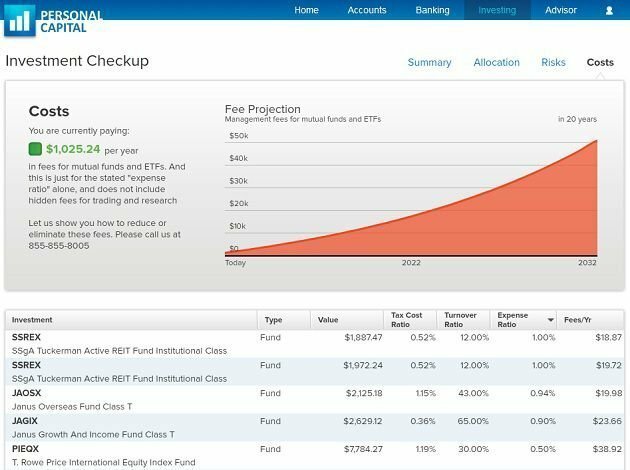 If you invested $10,000 in a fund with an expense ratio of 0.5% (typical for index funds), after 30 years you would have $152,203 and paid a total of $22,291 (or 12.8%) in expenses. Let’s look at another example. If you invested in an exotic mutual fund with an expense ratio of 2.5%, you would have only $87,550 and paid a whooping $86,944 (almost 50%) in expense fees. Ouch! So a high expense ratio can really hurt your investment performance; therefore, you should consider the expense ratio carefully when investing in mutual funds. Alternatively, individual stocks and ETFs may make sense if you can invest enough money to overcome the trade commissions. Here are a few basic rules I follow for investing with mutual funds. Avoid funds that charge a transaction fee — i.e., charge you when you want to buy/sell shares. Invest in funds that have a lower expense ratio; preferably less than 1.0%. Index funds usually have expense ratio of 0.5% or less, making them the perfect candidates. Invest in funds with a lower portfolio turnover ratio. A lower turnover ratio means that the fund manager does less “buy & sell” and more “buy & hold”. This should make the fund more tax efficient and help you in the long term. Identify the right asset allocation mix based on investment goal, time horizon, and tolerance for risk. Diversify the investment portfolio among several funds. When selecting a specific fund, at least look at the sector allocation, holdings, PE, average capitalization, location, and past performance. Rebalance the investment portfolio at least once a year. Reviewed and updated May 8, 2011. I’m wondering if you intend to answer my query above dtd 21 Sep 2013? I really think folks who you read your site would like the numbers going out for 40 years…for example, a working career from age 30 to age 70. Why ask for replies if you don’t intend on answering the mail? I’m wondering if you can easily push a computer program and create spreadsheet with a more reasonable Return? I think 10% is too high for a balanced asset allocation for most people. And folks really think they will bee getting a 10% return going forward. And I think it would be useful to see a spreadsheet with a .20% fee [aka Vanguard]. And finally I think it would be useful to go out further than 30 years. A lot of us will have a 40 year career and then if we have been savers/investors a significant amount of our nest egg will still be in our mutual fund while some of those various fees continue. Great article. I’m certain your work will motivate some folks to get off the dime. Do continue. @Kunal – The numbers are cumulative, so year 10 already reflects all the expenses over all 10 years. @Ken and GM – Thank you. I’ve got your 2011 & 2012 Quarterly Estimated Tax due dates article tacked to my wall, and this article is going to be tacked next to it. You rock. Pinyo – I appreciate the way you take an important concept, provide the data to make your point, and most importantly present solid solutions or rules to follow. Some people need mutual funds for the reasons you outline, however, most investors should abandon mutual funds and only invest in stocks and ETFs. This greatly mitigates the expense ratio assualt on returns. Another piece of great advice is “identify the right asset allocation mix based on investment goal, time horizon, and tolerance for risk”. I would just add “Valuations” as another consideration of asset allocation mix. At the end of 10 years, why is it that you are subtracting 24782 from 25937 to get the amount less? What about the fees he paid in his 1st year, 2nd year and so forth? Shouldn’t the amount less at the end of 10 years take all those fees into consideration since these fees are charged annually? Please let me know. Please take a look and let me know if you see what’s wrong. Why do the values in the far right column grow by 7.25% if the remainder after taking out the 2.5% is 7.5%? @Cory – thank you for your question. The problem is that mutual funds don’t charge the expense on just your contribution — they charge 1% on the entire amount (contribution plus growth). For example, if you have $55,000 after you invested the initial $10,000 for 20 years, you will be charged $550 (not $100). 1% of $10,000 = $100. How can -$100/year = -thousands of dollars? 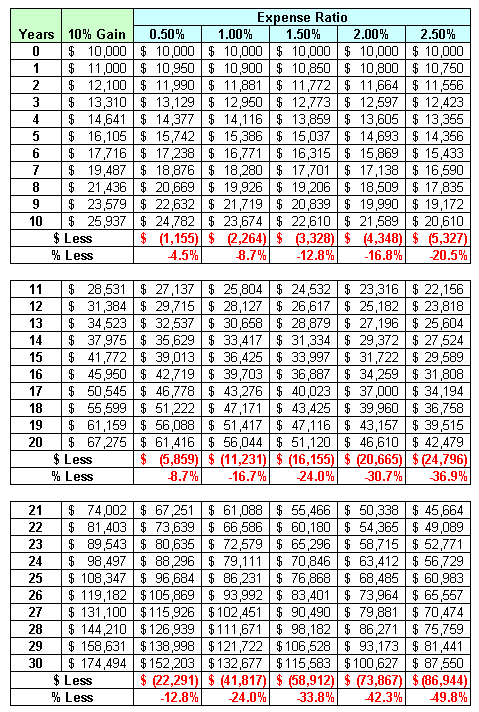 Does the mutual fund charge 1%/month? Or am I missing something? *I already receive regular email from Moolanomy thanks.